Mid-Atlantic Auctioneers, LLC, its agents nor Robert McArtor make any representations or warranties with respect to the accuracy of listing information. In addition, neither Mid-Atlantic Auctioneers, LLC, its agents nor Robert McArtor shall be held responsible for any discrepancies contained in the listings. Interested parties are encouraged to call Mid-Atlantic Auctioneers or Trustee to confirm cancellations. "A Night of a Million Dreams"
Robert McArtor nor Harvey West Auctoneers CANNOT be held responsible for errors in it's on-line listings. This list is provided as a service for an AT A GLANCE preview of future auction sales. Please refer to corresponding legal advertisements for further information.....all information found in legal advertisements SUPERCEDES information found in their on-line bulletin. 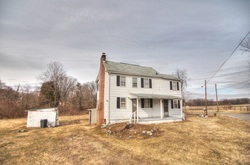 4 Bedroom, 1.5 Bath Colonial Farmhouse situated on Parcel 1 (.961 +/- Acres) and will be sold with adjoining Parcel 2 (1.558 Acres) with an additional development right. (SEE LETTER FROM HARFORD COUNTY BELOW) L.R., Kitchen, Full Bath, 1.2 Bath, Attic, Shed, Oil Heat (Updated System), Stove, Refrigerator, Washer and Dryer. Many Utility Updates in Basement including some plumbing and New Well Holding Tank. Contents Sold Separately as Entirety. (Same Day Removal Only - Will not have to take all contents, CASH ONLY) To Include (SEE PICTURES BELOW) John Deere 111 Lawn Mower, Ext. Ladder, Some Furniture, Costume Jewelry, Household goods, Kitchen Items, Tools, Hospital Bed, Fishing Items, Oil Lamps, Chairs, Lamps, Books, Trunks, Collectibles, Lots of items to sort through! Saturday, May 2nd., 2015 @10 A.M. Inspection 1 Hour Prior to Auction - 9 A.M. Terms of Sale: A deposit of $5,000.00 in the form of cash, cashier's check or certified check is due at the time and place of sale. A 10% Buyers Premium will be added to the Hammer Price to become the final contract price. The difference to bring the deposit up to 10% of Bid Price is due within 5 business days after the sale in the auctioneer's office. If payment of the additional deposit or the balance of the purchase price is not made within the specified periods, the deposit will be forfeited and the property may be resold at the risk and expense of the defaulting purchaser. Settlement is 30 days from the sale date. All expenses, including real estate taxes, sanitary and/or metropolitan district charges, special assessment and private utility charges are to be adjusted to date of sale and assumed thereafter by the purchaser. Cost of all documentary stamps, settlement costs and transfer taxes to be paid by the purchaser. The property will be sold in "As is" condition without express or implied warranty as to the nature and description of the improvements. The property will be sold subject to easements, agreements, restrictions or covenants of record affecting the same, if any. Dimensions and acreage are more or less. Time is of the essence as to the terms of this contract. No Buyers Premium will be added to the Personal Property. Personal Property shall be paid by CASH ONLY and paid DIRECTLY to the PERSONAL REPRESENTATIVE before proceeding to offering the Real Property for sale. A 1.5% Broker Fee will be paid to a participating broker who has filled out a Broker Participation Form up to 24 hours prior to the auction sale and his/her Buyer becomes the successfull bidder at auction.